"Then He Kissed Me" is a song written by Phil Spector, Ellie Greenwich and Jeff Barry. The song, produced by Spector, was initially released as a single on Philles Records (#115) in July 1963 by The Crystals. It is a narrative of a young woman's encounter, romance, and eventual marriage with a fellow youth. In 2004, this song was #493 on Rolling Stone magazine's list of 500 Greatest Songs of All Time. Pitchfork placed it at number 18 on its list of "The 200 Greatest Songs of the 1960s". Billboard named the song #8 on their list of 100 Greatest Girl Group Songs of All Time. The single is one of The Crystals' most remembered songs. It was recorded at Gold Star Studios in Los Angeles in April 1963. The lead vocal was sung by Dolores "LaLa" Brooks, the arrangement of The Wrecking Crew's Wall of Sound was by Jack Nitzsche and Larry Levine was the engineer. In the United States the single peaked at number six and in the United Kingdom the single peaked at number two. The single was The Crystals' third single to chart in the top ten in the United States and their second to reach the top ten in the United Kingdom. The song was also a major hit in the Republic of Ireland, reaching number three in the charts there. 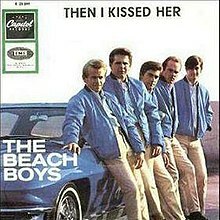 (1966) "Then I Kissed Her"
The song was reworded to the title "Then I Kissed Her" and released by The Beach Boys on their 1965 album Summer Days (And Summer Nights!!) with Al Jardine on lead vocals and production by Brian Wilson. Beyond title and gender changes, new lyrics were written retelling the story of the Crystals' song from the boyfriend's point of view. Two years after appearing on the album, in April 1967 the song was released as a single in the United Kingdom, appearing as a stop-gap release while work continued on the "Heroes and Villains" single. This was reportedly done against the band's wishes, Beach Boys band member Mike Love commented on May 7, 1967 "The record company didn't even have the decency to put out one of Brian’s own compositions. The reason for the hold up with a new single has simply been that we wanted to give our public the best and the best isn't ready yet." "Then I Kissed Her" charted at number four in the United Kingdom. The B-side of the single was "Mountain of Love", a song off the band's 1965 Beach Boys' Party! album. According to contemporary national charts sourced and cited by Billboard in 1967, it reached No. 2 in Sweden and South Africa and No. 9 in Belgium. It was No. 12 in Australia's Go Set chart and No. 6 in New Zealand. In 1963, the French singer Richard Anthony recorded it in French titled "Et je m'en vais". Sonny & Cher recorded the song in 1965 on the French I Got You Babe EP. In 1972 The Marvels released a reggae version on Trojan Records. British glam rockers Hollywood Brats recorded the song in 1973. Later the song was recorded and re-titled "Then She Kissed Me" by another British glam rock band Hello for their 1975 album Keeps Us Off the Streets. Kiss on their 1977 album Love Gun, as "Then She Kissed Me." In 1978, Swedish pop-wonder Magnus Uggla made a notorious recording in Swedish titled "Å, han kysste mej" (Lit, "Oh, he kissed me") on the album Vittring. In 1980, the Icelandic punk-pop band Fræbbblarnir covered "Then I Kissed Her" on their album "Viltu Nammi Væna?". In 1981, British glam rocker Gary Glitter recorded the song as "Then She Kissed Me" and reached #39 on the UK chart. In 1984, the experimental New Wave band The Flying Lizards released a version of it on their final cover-themed album Top Ten. In 1988, Pakistani pop singer Nazia Hassan did remix with Meera Syal and actress Rita Wolf, which was produced by Grammy Award Winner Biddu. Country-rock singer Juice Newton released her own version of the song on her 1989 album "Ain't Gonna Cry". In 1995, the Spanish punk rock band The Killer Barbies included the song on their debut album Dressed to Kiss. In September 2007, New York shoegazing band Asobi Seksu released a version of it as the B-side of their single "Stay Awake". Former Asobi Seksu drummer, Bryan Greene, recorded a live version in July 2009 with his band Escape Key, incorporating both male and female vocals. Bruce Springsteen recorded the song live several times in 1975 (as "Then She Kissed Me") and revisited it again 33 years later by opening his August 23, 2008 concert in St. Louis, MO with it. Springsteen also played the song as a request during the encore at the BankAtlantic Center in Sunrise, FL on September 13, 2009. The song has also been recorded by Austin, Texas based country band The Derailers as "Then She Kissed Me" on their 1999 album Full Western Dress. The English beat group The Tremeloes recorded a version under the title "And Then I Kissed Her". The Guess Who released a version of the song called "Then I Kissed Her" as part of a medley on their 2014 re-issue of Power in the Music. Camu Tao reuses the song's signature line in his song "Death" from his album King of Hearts (Camu Tao album). The Crystals' version was used in its entirety in the 1990 film Goodfellas during the famous three-minute tracking shot through the Copacabana night club. In an homage to that scene, the song (in an artificially extended version) was used in the final episode of The Daily Show with Jon Stewart. The song was also used during the opening credits of the film Adventures in Babysitting, as Elisabeth Shue dances and lip-syncs the song. It is also heard at the end of the film during the last scene and over part of the end credits. It was used in a scene from The Simpsons 2006 episode "Marge and Homer Turn a Couple Play". The song inspired The Sun front-page headline And Then He Kissed Her on 30 July 1981, the day after the marriage of Prince Charles to Lady Diana Spencer. The song was parodied in the South Park episode "Holiday Special". In 2018, in the episode of the seventeenth season of Family Guy, "Stand by Meg," when Chris enters the building of Vocatinal School, a man guides him to a classroom in a style of the Goodfellas long shot, thus the song is used. In 2019, the song was used in 'Call The Midwife' final episode to the series on Sunday 3rd February, by the BBC. ^ "The RS 500 Greatest Songs of All Time". RollingStone.com. Retrieved 2008-09-21. ^ "Staff Lists: The 200 Greatest Songs of the 1960s | Features". Pitchfork. 2006-08-18. Retrieved 2014-05-24. ^ "De Nederlandse Top 40, week 26, 1967". Archived from the original on 2007-12-28. Retrieved January 10, 2009. ^ "charts-surfer.de search results". Retrieved January 10, 2009. ^ "irishcharts.ie search results". Retrieved January 10, 2009. ^ "norwegiancharts.com". Retrieved January 10, 2009. ^ "everyhit.com search results". Retrieved January 10, 2009. ^ "Chart Stats – Beach Boys – Then I Kissed Her". Retrieved January 10, 2009. ^ Slowinski, Craig. "Summer Days (And Summer Nights!!)". Retrieved April 8, 2019. ^ "Sonny & Cher – I Got You Babe (Vinyl) at Discogs". Discogs.com. Retrieved 2014-05-24. ^ "London – Entertainment – Newspaper exhibition". BBC. Retrieved 2014-05-24. "I'm Bugged at My Ol' Man"
This page was last edited on 8 April 2019, at 23:03 (UTC).